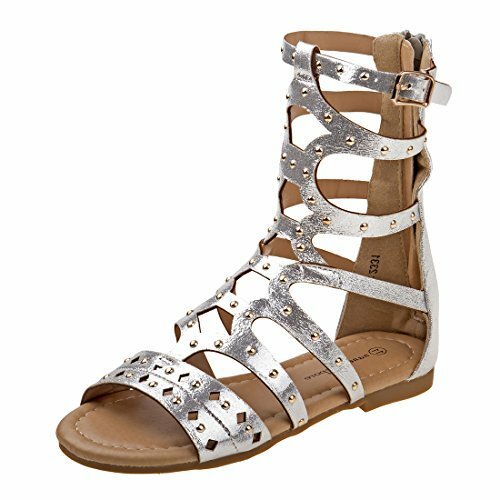 Nanette Lepore girl's open toe gladiator sandals are perfect for your little princess. Great for warm weather wear and sophisticated enough for more formal summertime events. She will love the metallic strappy look and stud accents, they will be your daughters go to for comfortable dressy footwear. Two Colors available so you can pick the perfect one for any outfit; Please Reference the Variations for All Available Sizes & Colors! Treat your little girl to her new favorite sandal by Nanette Lepore. She will look great during special occasions while staying comfortable during hours of wear. Stop by Our Storefront to See the Rest of Our Great Deals! If you have any questions about this product by Nanette Lepore Girls, contact us by completing and submitting the form below. If you are looking for a specif part number, please include it with your message.